On Monday, April 30, Delaware County United for Sensible Gun Policy held a forum at the college for candidates running in the 5th congressional district primaries on May 15th. The forum, which lasted about two and a half hours, was held to allow constituents to hear the candidates’ positions on topics such as gun lobbying, gun laws, and gun ownership. There are currently eleven candidates running in the upcoming representative primary on May 15. The Pennsylvania Supreme Court ruled in January that the old congressional map, created under the 2011 Pennsylvania Redistricting Act, was excessively gerrymandered. The Court released a new, non-partisan map on February 19. Delaware County, in which Swarthmore is located, was previously split between the 1st and 7th congressional districts but now lies in the 5th congressional district, according to the new map issued by the Pennsylvania Supreme Court. The incumbent representative for the 5th district is Republican Patrick Meehan, who announced that he would not seek reelection after the New York Times revealed that Meehan had paid out a sexual harassment settlement to a former staffer. Currently, ten candidates are running in the Democratic primary while Pearl Kim is running unopposed in the Republican primary. With the new congressional map, it is likely that Democrats will capture the 5th district seat in the November general election. 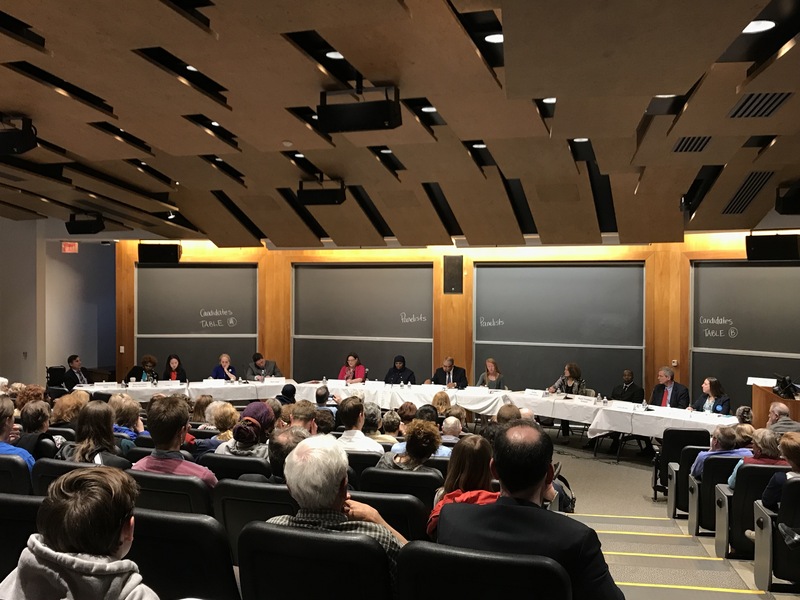 Candidates present at the forum were Mary Gay Scanlon, Lindy Li, Ashley Lunkenheimer, State Representative Margo Davidson, Rich Lazer, Mayor of Chester Thaddeus Kirkland, Molly Sheehan, Larry Arata, and State Representative Greg Vitali. Democratic candidate Theresa Wright and Republican candidate Pearl Kim did not attend. The forum was moderated by Reverend Peter Fredrichs and there were four forum panelists: John Linder, Movita Johnson-Harrell, Kiera Caldwell, and Swarthmore Professor of Political Science Tyrene White. Over the course of the forum, nine questions were posed to the candidates regarding the influence of the NRA and gun lobbyists, gun violence, illegal gun sales, and gun suicide as a public health epidemic. Other questions included how candidates would approach bipartisanship, and what policies candidates would support in order to decrease the number of mass shootings. During the forum, each candidate emphasized their strengths and areas of expertise. Molly Sheehan, a postdoctoral fellow at UPenn repeatedly spoke about her determination in overturning Citizens United, the Supreme Court case that allows corporations to spend ‘soft money’ on political campaigns. Mary Gay Scanlon, an attorney and former Wallingford-Swarthmore school board president, spoke about her past experience with bipartisanship. Larry Arata also shared how his experience as a public school teacher affected his views on guns. The Delaware County Democratic Party has not endorsed a candidate in the primary. The Swarthmore College Democrats announced on April 26th that they would be backing Mary Gay Scanlon. 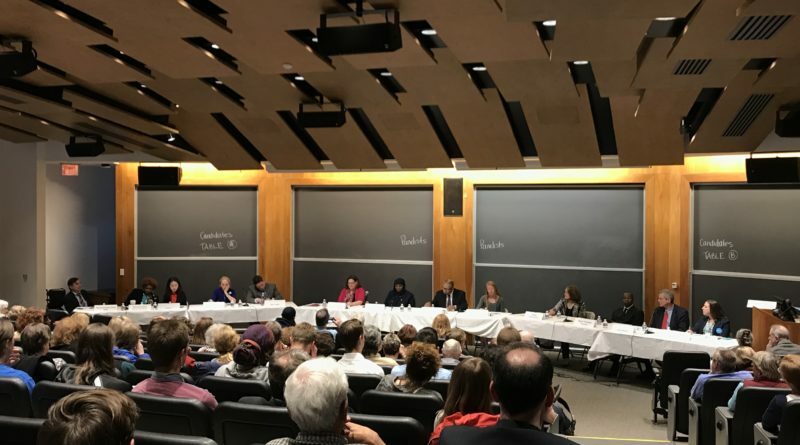 Cassandra Stone ’20, a Deputy Field Director for Scanlon, thought that the forum was a good opportunity to hear the positions of all of the candidates despite being set on who she would vote for. While the forum was focused on gun policy, many candidates also discussed the large influence of money in politics and on campaign funding. Arata took aim at former federal prosecutor Ashley Lunkenheimer because her campaign is backed by a super PAC. Lunkenheimer revealed to philly.com that her mother is a major funder of the super PAC, which is called Progress in PA-05. Though the focus of the forum strayed occasionally, constituents were given an opportunity to hear candidates’ thoughts on guns and to learn more about the candidates’ platforms in a crowded race.